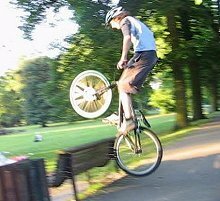 The bunny hop is essential for clearing obstacles on a fast track....or as a climbing starter...It is really the same move as for the backhop, but moving along at any speed. 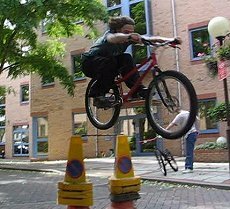 Quite a useful move in street trials where everything is flat and square, but totally useless in natural biketrials where there is rarely any run up distance. 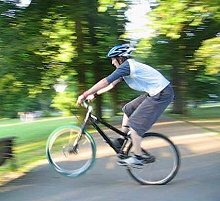 1° Make sure you build up enough speed to clear the obstacle length during your bunny hop, then stop pedaling and move your body forward. 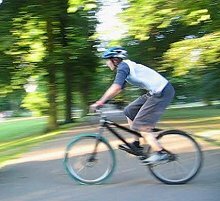 2° As you approach, in one fluid motion, crouch on the bike to compress up both tyres, and finish leaning back to push on the rear tyre. 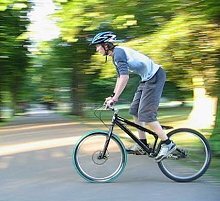 3° At this stage, straighten both your arms and legs to shift your full weight on the rear tyre and lift the front wheel, keep pushing on the ground. 4° Carry on with full explosive extension, keeping the arms straight to maintain pressure on the ground while moving up on the high pedal position. 5° You are ready to take off, fold back from your extension, upwards and pull up the bars while lifting up the knees to clear the way for the bike. 6° Lift the rear wheel further by gripping up the pedals with your soles (back-pressure), and tuck until you have cleared the obstacle. 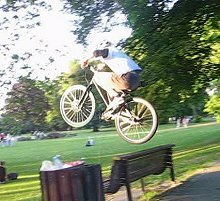 Lifting the bike in a bunny hop? 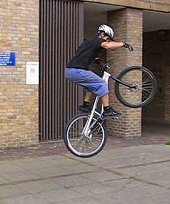 Pulling the handlebars after the full extension is the main trick, because your feet can't lift the bike. It looks like the feet are stuck to the pedals, but in fact they are just limiting the ascension of the bike. You can make them grip more by applying back-pressure on the pedals, that is, pointing your feet downwards and pushing back up on the platform. 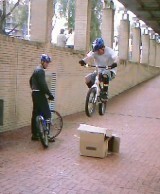 For the impulse, think about jumping on your feet without a bike. You need to flex the knees, then full extension, and then folding back in the air to get over the obstacle. On the bike, same business, flexing before a full extension from the highest position on the pedals (when the bike is standing on the rear wheel). During the extension, the arms are kept low to keep the rear wheel pushing on the ground, but as soon as the extension is over, it is time to fold back the knees with a synchronised pull on the arms upwards to lift the whole bike. All the move takes less than a second. 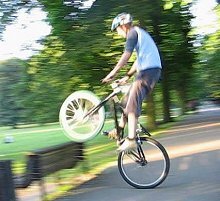 The higher you lift the handlebars, and then the faster you push them forward in a wave motion, the higher you can get the back wheel off the ground. Of course you need some synchronisation, this is the difficult bit that needs hell of practice. You can practice with full brakes on (the safest way to understand the move). That leads you to the back hop. If you want an even more detailed tutorial, also check out this Monster Bunny Hop Article. Why aren't clip pedals recommended for this?